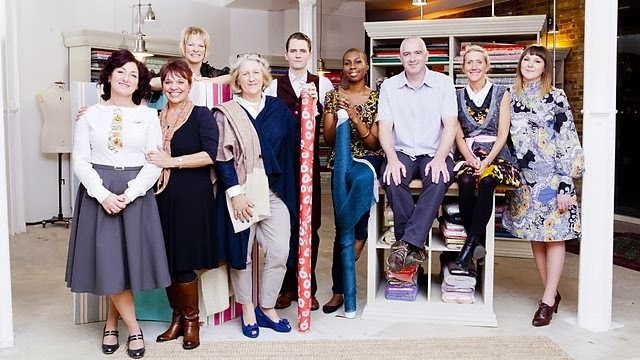 Great British Sewing Bee Series 2 Episode 1! I don't have much to show for myself today - a bunch of failed bodice fittings and a half-finished jumper - so I thought I'd write about the Great British Sewing Bee second series episode 1! I might do this for the other episodes too. I found out about this show when the first season aired last year - while my parents were in England they happened to see an episode on the TV and knew I'd love it! The second series is slightly different - 10 contestants instead of however many there were last time, and much harder challenges. There were three challenges this week, based on three natural fibres: cotton, wool, and silk. Challenge 1 was to make a cotton top from a pattern, no alteration or decoration. I think that was mostly to see if there was anyone who *really* shouldn't be there. There were some lovely cute tops, all sleeveless and with a facing - which had to be made in 2 hours! Fast! The next challenge was to take a plain grey wool maxi-skirt and alter it in some creative way. Basically everyone made it into a mini-skirt with some detail. I think I would have kept the fabric in one piece but made horizontal pleats to shorten the skirt and add interest. Can you believe that one guy made a welt pocket in like 30 minutes?? We did that at CIT last week and it took us 3 hours! The last challenge was to make a fitted silk nightgown for a model. I learned some tricks about cutting slippery silk - best to do it with a rotary cutter because scissors make the fabric shift. Some of these nighties were spectacular (some sucked) and I was just so impressed. It made me want to make a nightie! This show has inspired me to get back to sewing. After a few failures recently, I've given up and now I have a big pile of unfinished things and patterns to make. But failure is just a step on the road to success I suppose, I'd better get back to it. Totally watch this show! It's the best! Wow that show sounds so fun! I'm going to try to find some episodes! I'd love to get into sewing!